In April, after I wrote my last post from the Hall of Flags, I was emailing with Manjula Dissanayake, one of the students featured. A week later, we sat down and he described the incredible path he has followed from his pre-Fletcher days to now. With Commencement just around the corner, I’m featuring Manjula’s story. It all starts in 2007, when Manjula was working in finance in the DC area. 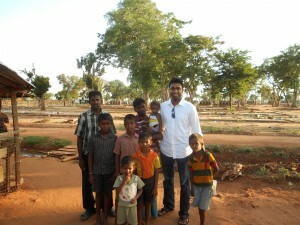 He and his roommates had previously raised funds for Sri Lanka after the 2004 tsunami, but they felt they could do more. 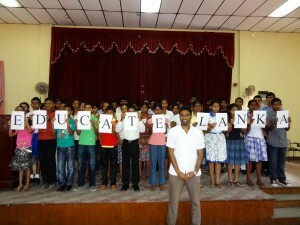 They decided to focus their efforts in the area of education, forming Educate Lanka. Before long, Educate Lanka was occupying so much of Manjula’s time that he decided to dedicate himself to the effort, starting by pursuing graduate study in development and social entrepreneurship, either through an MBA or an international affairs degree. An application process later, he enrolled in Fletcher’s MALD program in September 2010 as a Board of Overseers Scholar, and quickly got to work on building his own intellectual infrastructure to run the organization, which currently has a core volunteer staff of ten, and a larger pool of about 40 to draw upon. I should pause here and describe Educate Lanka. The organization’s main activity is securing micro-scholarships of $10 to $20 for students who lack funds but have a high potential to become future leaders, by connecting the kids with sponsors from around the world. 100% of the sponsorship funds go to the students. There are no administrative expenses (this being a fledgling organization), but if something comes up, funds are raised through a separate fundraising process, which also generates some scholarships for students without sponsors. Currently 275 students are receiving scholarships. A total of 350 have received funds, about 30 of whom have completed school (though a few left school and the program). There are over 400 sponsors in 15+ countries. Once they are in the program, the kids are funded through their undergraduate studies, starting as early as fifth grade (age 10). Over 12 million Sri Lankan Rupees (about US$100,000) has been awarded. Back to fall 2010. Manjula settles in, registers for courses, etc. Good things started to happen pretty much right away. The first was that Educate Lanka was selected to receive the funds raised through Fletcher’s annual Asia Night event. That same semester, Manjula drew support from Empower, a project of the Tufts Institute for Global Leadership (IGL). And Educate Lanka took third place in the Tufts 100K Business Plan Competition. Not a bad start for one semester, and at that point Manjula started to think Educate Lanka had the potential to become a larger organization. In spring 2011, Manjula took a microfinance class with Kim Wilson, and cross-registered for a Harvard class on education and social entrepreneurship with Fernando Reimers. Both professors offered advice on complementary models for Educate Lanka, and on how to make the organization more sustainable and scalable. Should it continue as a 501(c)3 (non-profit)? Or should it turn into a blended social business? Also that semester, after attending the Harvard Social Enterprise Conference, someone referred him to USAID and the State Department, because he works with the Sri Lankan diaspora community, which led to an invitation to speak at the Secretary’s Global Diaspora Forum. 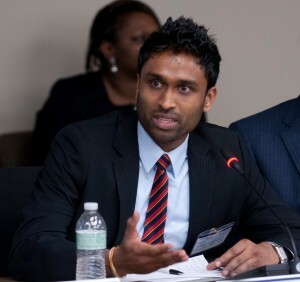 Come summer 2011, while also interning in the Education Investment Group of the World Bank’s International Finance Corporation, Manjula was a finalist in the MassChallenge competition, as a result of which he received mentorship and guidance. Toward the end of the summer, he used a fellowship from IGL to travel to Sri Lanka, visiting the north and east of the country, where Educate Lanka wasn’t yet working. He returned with a sense of how to achieve near-term organizational expansion in Sri Lanka, including a corporate partnership model. Back at Fletcher in September 2011, Manjula reconnected with Prof. Wilson and Prof. Reimers, who together mentored him and helped him to think about global replication and to add a corporate partnership model to Educate Lanka. An MIT class on Development Ventures required him to take his ideas and act on them. He received another IGL/Empower fellowship to return to Sri Lanka during the winter break. And he continued entering business plan competitions. He was one of two finalists in the MIT 100K Elevator Pitch Competition. His Fletcher classmates sent more funds Educate Lanka’s way from 2011 Asia Night proceeds, and Manjula was one of a small group honored as a UN Volunteer of the Year in Sri Lanka. Also helpful, more Fletcher students were jumping on board, including a group that wrote a consulting report on the concept of distance learning in Sri Lanka. He received additional funding from the Center for Emerging Market Enterprises, and IGL is committed to supporting Manjula, even after graduation. I asked Manjula to reflect on his Fletcher experience, which seems to have been uniquely successful in connecting him to the local academic community. He said that he came to Fletcher “with the idea to get more guidance, more advice” and to “test the model and see if it has legs.” He confirmed that he was able to do that through classes, the business plan competitions, talking to mentors, seeing the response of people who believe in the Educate Lanka model (including some who want to replicate it elsewhere in South Asia and in Africa), and talking in panels and at conferences. All of this pushed him to move Educate Lanka toward a sustainable social business model while maintaining its core scholarship model. I’m going to try to keep up with Manjula and Educate Lanka through the coming year, and I’ll report back on Manjula’s post-Fletcher path. Based on his success in the past two years, I’m guessing there will be plenty to write about. Dear Menushka, Ashen, Yohantha – Thank you so much for the kind words and support. It means a lot! Please continue to follow Educate Lanka for things to come! Dear Sherm – Thank you! Your backing and blessings have inspired me to continue my work with Educate Lanka. I am extremely grateful for everything you have done in the past and things to come in the future. Will be in touch! Congratulations on your efforts and your compassionate nature! Your vision, intellect, passion and diligence have inspired us. You have also been an extraordinary Institute for Global Leadership leader of Empower as our Fletcher coordinator and have enabled us to evaluate and support scores of worthy projects. Yes – we will continue to support you and to engage the next generations of our student social entrepreneurs to learn by your example and to support your efforts. you are a great inspiration to all lankans. keep up the good work brother. I’ve just been to the educatelanka website and I think you are simply a genius for coming up with this concept. I sincerely wish you all the very best and have every strength to develop this further. You have the blessings of tens and thousands of children with everything you do. Keep up the good work. I am sure we are going to hear and see more of you. Keep up the brilliant work brother..You have done us all proud. Thank you all for your kind words and best wishes! I am extremely humbled by all the responses, and I hope to work even harder in the future! It was agreat honor to meet you and share your ideas and dreams, Manjula. Keep the light shining for the kids to walk the path of their dreams. I probably was most unlikely to know about you. But when a star is born, the news reaches far and beyond. I admire you so much and am very proud of you, Manjula! You inspire us and make us proud Manjula! What a nice testament! Thank you, Ruffy! I have Seen the work that this guy does and all I can say is that he is one remarkable fellow. Keep up the great work!